The Jeep Gladiator truck was introduced in the Fall of 1962 along with the Wagoneer. The 1963 and 1964 J-200 and J-300 models were available with a 120" and a 126" wheelbase with 4000 up to 8600 GVW. Most models were available with either Thriftside (narrow box) or Townside (wide box) beds. 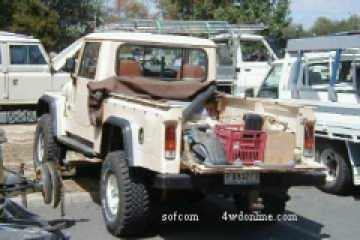 All models were available with or without a bed, cab & chassis or stake bed dually. Midyear in 1965 Kaiser-Jeep switched Gladiators over to a four digit model number, changing the J-200 and J-300 to J-2000 and J-3000. In late 1965 the IFS suspension was deleted. In 1967 the two wheel drive models were dropped. In 1970, the Gladiators got the same style grill as the Wagoneer, it's first styling change since its introduction. Late in 1969, the J-3000 added a 132" whellbase to it's line up with 8000 GVW. In 1970 the 126" wheelbase was dropped from the J-3000 models. AMC took ownership of the Jeep line in 1970 and in 1971 four new 132" wheelbase Townside Gladiators were added to the line-up under the designation J-4000. The J-3000 line was dropped. Models: J-4500 5000 GVW, J-4600 6000 GVW, J-4700 7000 GVW, J-4800 8000 GVW Townside, cab & chassis or stake bed. 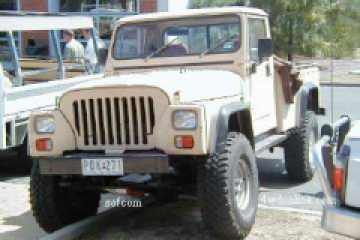 The "Gladiator" name was dropped in 1972 and the Jeep trucks were simply called Jeep trucks. In 1974 the model designations were changed to only reflect vehicle load capacity rather than load capacity and wheel base. J-10 119" wheelbase, J-10 (131") and J-20 (131"). The J-10 was a half ton truck and the J-20 was a three quarter ton truck. GVW ratings were 6200, 6800, 7600 and 8400. The J-20 was available with or without a bed, cab & chassis or stake bed dually. In 1980, a new Sportside bed was offered on the 119" J-10. 1984 was the last year for the 119" J-10. Chrysler Corporation took ownership of the Jeep line in 1987. By this time, the Jeep truck was dated in design and would be competition for the existing Chrysler owned Dodge truck line. The last year of Jeep truck production was 1987. Some were sold as 1988 models to clear out inventory. The Jeep truck legacy expires.